Kevin Smith Transportation Group services the entire Delaware Valley. KSTG delivers services daily in Bucks, Chester, Delaware, Montgomery, and Philadelphia counties. This includes more than 300 cities, towns, boroughs, and townships. One of the places you will regularly see a KSTG vehicle is Montgomery County, PA.
Montgomery County, locally also referred to as Montco, is a county located in the Commonwealth of Pennsylvania. In the last census, the population was 799,874, making it the third-most populous county in Pennsylvania, after Philadelphia and Allegheny Counties, and the 71st most populous in the United States. Kevin Smith Transportation Group delivers services every day in Montgomery County, PA, from Weddings and Nights on the Town to Corporate Transportation including Airport Transfers and Shuttle Services. The county seat is Norristown, PA. Montgomery County is very diverse, ranging from farms and open land in Upper Hanover to densely populated rowhouse streets in Cheltenham. The county was originally created in 1784, a few years before KSTG officially delivered its first services! 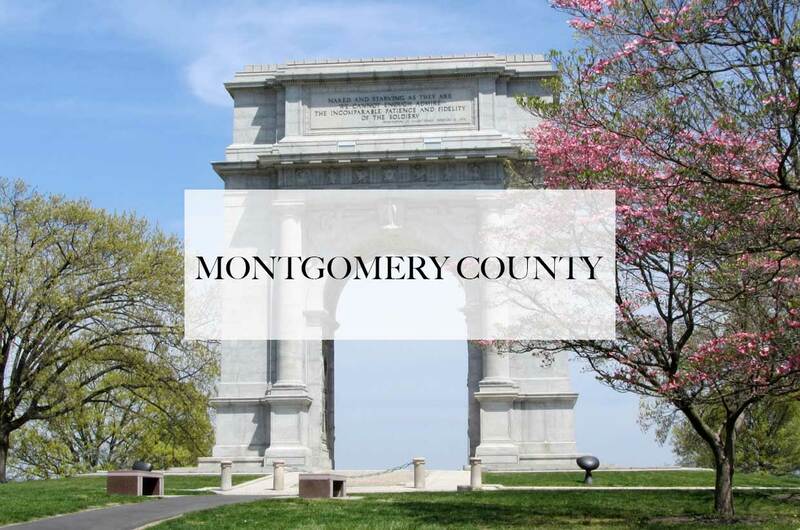 According to the US Census Bureau, there are 487 square miles in Montgomery County, PA.
Montgomery County is a suburb of Philadelphia and consequently, many of its residents’ work in the city. However, Montco is also a major employment center with large business parks in Blue Bell, Lansdale, Fort Washington, Horsham, and King of Prussia which attract thousands of workers from all over the region. One of Kevin Smith Transportation Group’s largest divisions is their Corporate Shuttle Services, moving employees across Montgomery County, PA to the local train stations. The strong job base and taxes generated by those jobs have resulted in Montgomery County, PA receiving the highest credit rating of ‘AAA’ from Standard & Poor’s, one of fewer than 30 counties in the United States with such a rating. Montgomery County, PA is a hub of educational institutions. In addition to 7 school districts being part of the top 30 employers in the county, there are 16 colleges and universities also located throughout Montgomery County, PA. KSTG, with a fleet of Sprinters and Mini Buses, delivers non-academic transportation students across more than 30 schools in the county. KSTG is the preferred Transportation Company for student-athletes in Montgomery County, PA.
Kevin Smith Transportation Group’s Wedding Coordinators regularly recommend the park for pictures due to the amazing vistas that exist throughout the park. The park encompasses 3,500 acres and is visited by over 1.2 million people each year. Visitors can see restored historic structures, reconstructed structures such as the iconic log huts, and monuments erected by the states from which the Continental soldiers came. They also make for amazing pictures when staged by your Wedding Photographer. Visitor facilities include a visitor center and museum featuring original artifacts, providing a concise introduction to the American Revolution and the Valley Forge encampment. Ranger programs, tours and activities are available seasonally. The park also provides 26 miles of hiking and biking trails, which are connected to a robust regional trails system. Wildlife watching, fishing, and boating on the nearby Schuylkill River also are popular. Kevin Smith Transportation Group offers a variety of services in Montgomery County, PA. On the social side, a KSTG Limo or Wedding Shuttle might be seen on any given weekend. Requests for transportation for a Night on the Town or a Party Bus to go to Philadelphia, PA for a concert or show are routine for residents of Montgomery County, PA. If someone in Montgomery County, PA is headed to the Manhattan Cruise Terminal or Philadelphia International Airport (PHL), you can be assured that a KSTG Black Yukon or Mini Bus are ready for the transfer. If you run or work at one of the many successful companies with offices in Montgomery County, PA, you may occasionally have a need for some of the Corporate Transportation services offered by Kevin Smith Transportation Group. This could include Airport Transportation to more than 8 International Airports, including Newark International (EWR), Kennedy Airport (JFK) and of course Philadelphia International (PHL). Shuttle Services are also popular for companies in Montgomery County, PA, often moving employees from local SEPTA station to company offices. In the afternoon, those same KSTG Sprinters or Mini Buses will take those employees back to the train as they head home in Philadelphia, PA. For companies that utilize Private Aviation to travel around the country, a KSTG Cadillac XTS or Black Yukon is likely to be seen across Montgomery County, PA headed to one of more than a dozen regional airports, including Northeast Philadelphia Airport, Wings Field or Doylestown Airport. Kevin Smith Transportation Group wants to thank everyone from Montgomery County, PA for choosing us as their preferred Transportation Company. With a focus on Luxury and Service, KSTG wants to be your only choice when considering transportation for everything from a once in a lifetime Wedding celebration to needing Shuttles or Sprinters for a Corporate event. KSTG and Montgomery County, PA, working together for all your Transportation needs.